After spending 7 blissful days beachside in Phuket, it was time for our travel family to head to our second destination- Siemreap, Cambodia. My Uncle Bill had left 2 days prior to stop off in Singapore and Vietnam before ultimately joining us in Cambodia as well, so our group consisted of the 5 of us and our carry on bags. In planning our trip, Julio and I had wanted to include at least one new country on this vacation, since we had been to Thailand before, and we settled on Cambodia because I was dying to see the temples at Angkor Wat. We made sure to research what vaccines and visa requirements we would need before entering Cambodia, and starting planning our flights. 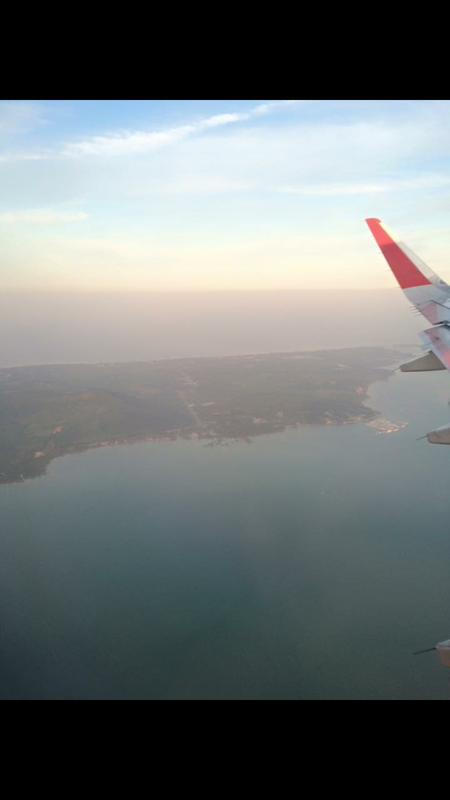 Allison booked our flights on AirAsia, leaving out of Phuket International Airport into Siemreap. Our flight was only $112 per person, but since it’s a smaller airline and our carry on bags definitely weighed over 7 kilograms, we paid to check one bag per person for both of the flights (we had a layover in Bangkok) so the total came to $144 per person. Being of the American mindset, we left our hotel at 3:45 in the morning to allow check-in two hours before our flight. We didn’t need nearly that much time, and could have used the extra sleep, since we breezed through security and then sat down to an hour and 50 minute wait for our flight. 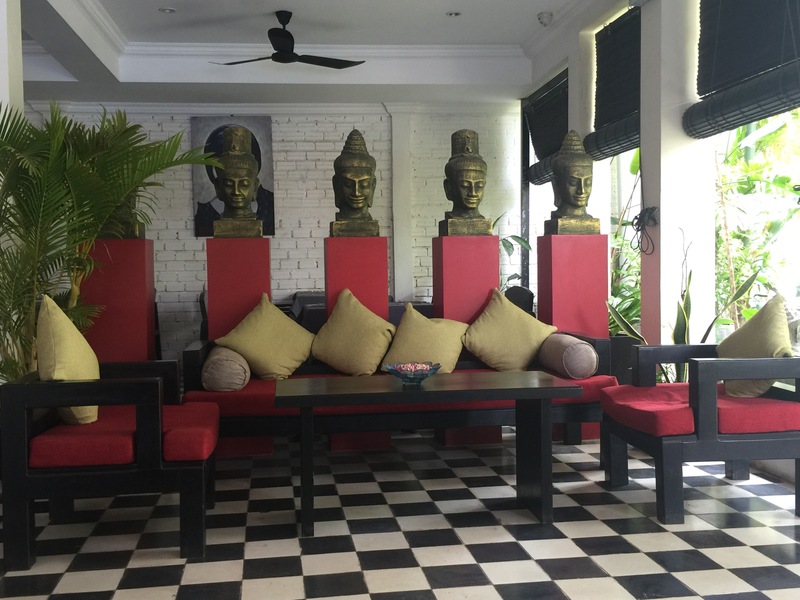 Our luxurious hotel in Siemreap. 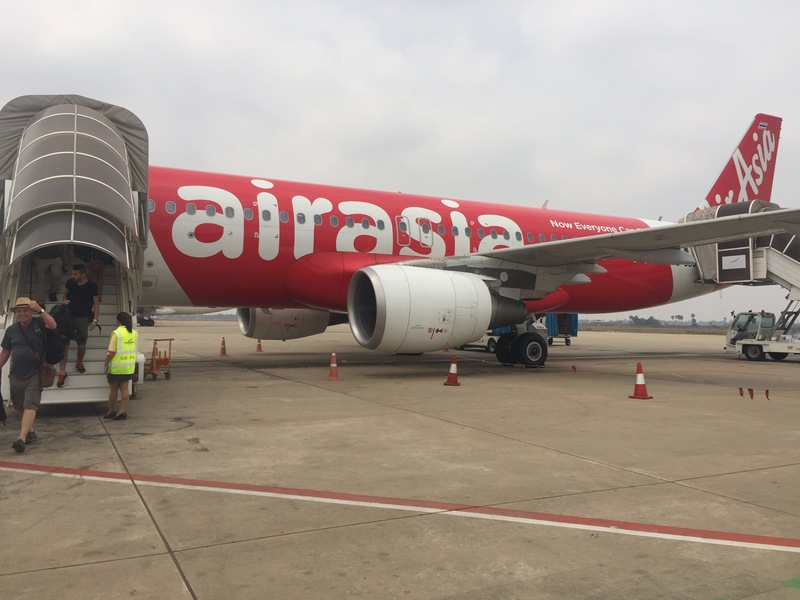 Our first flight was uneventful, and they had given stickers to passengers who were “flying through” Bangkok, so we were escorted with a group of about 15 people through the airport to our next gate. The nice thing about both Bangkok airports is that they are huge, and they have a variety of food choices and snack shops. When we were in Guangzhou, China for our layover, the entire A terminal had one restaurant, a crappy expensive pizza place. We grabbed Subway for lunch, and had a short wait for our 40 minute flight to Siemreap. Thailand doesn’t require a visa to enter the country, nor do they have vaccine requirements (just some recommendations) but Cambodia requires a visa for U.S. citizens. We also got malaria prescriptions just to be on the safe side, even though the guidebooks say that malaria isn’t present in the major cities of Siemreap and Phnom Penh. I also read that you needed a passport sized photo for the visa, which we got before we left, otherwise you would be “fined.” It would have been worth it to pay the fine as we found out, because Joe misplaced his photos at some point during the journey, and paid an extra $2 on top of the $30 visa fee for not having a photo. Meanwhile, Julio and I had spent $5 on passport sized photos at Costco before we left, and when we got back, I found our old photos left over from 2 years ago when we renewed (or in Julio’s case, purchased for the first time) our passports! Oh well. 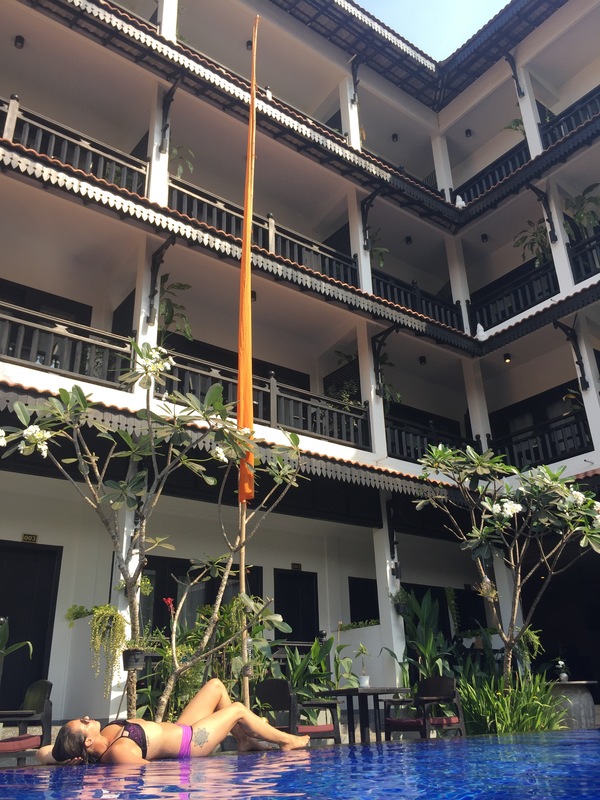 Getting our visas was a pretty quick process, our flight landed in Siemreap at 11am and we were through customs and getting into our van by 11:30. 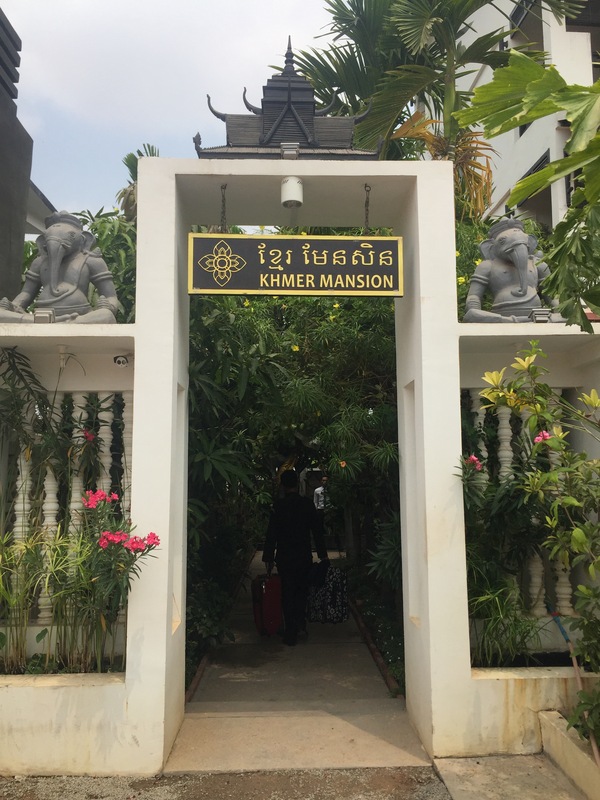 The Khmer Mansion Hotel provides free airport transfer for hotel guests, so we had a nice driver waiting to pick us up. After a 15 minute ride, we arrived at our home for the next 4 days. 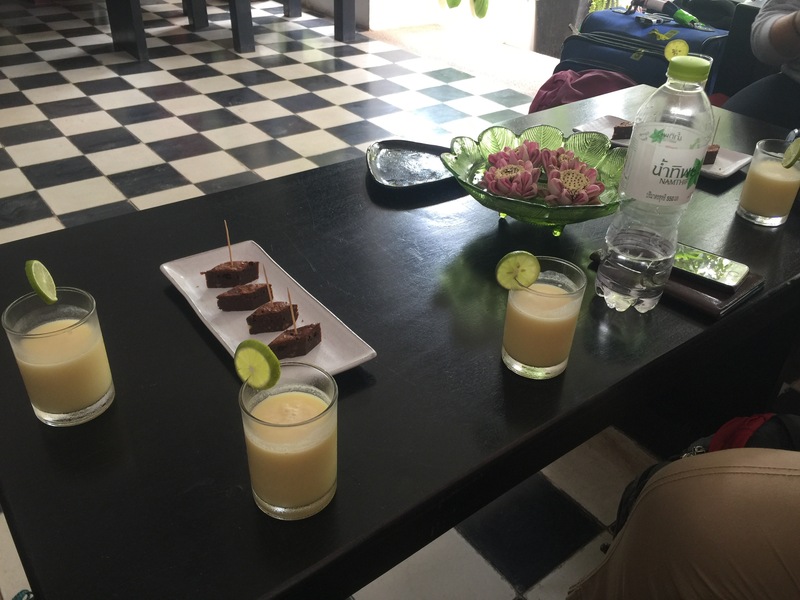 We were greeted warmly by the hotel staff, given welcome drinks and snacks, and even though our rooms weren’t quite ready yet, we had a place to change and take advantage of the amazing infinity pool on the property. Getting from place to place in Southeast Asia is a longer process than anywhere in the states, and modes of transportation can be a little unconventional, but it’s cheap and always makes for a great memory.